©2012 R.L. Delight, Wave Study 14, 6"x8",oil on hemp canvas. I will be posting a bit erratically until the new year but here is Wave Study #14. I painted this yesterday and it was cold and stormy. There was actually a sun break out on the horizon. I didn't quite get the effect in the painting but I could see one of the several squall lines that hit me. I could actually see the wall of wind coming as the spindrift would start to rise in the distance and get nearer. Judging the distances by eye, I would say the spindrift was shooting up at least 20 feet. I tried painting those cross-waves again. This one is a bit better although I still need to get a few more aspects to make them look right. Due to the cold and wet, I only lasted two and a half hours out there. I spent another hour in the studio to get the painting to this stage. I worked from memory. Painting in this manner and not using photos for reference is slowly developing my visual memory. 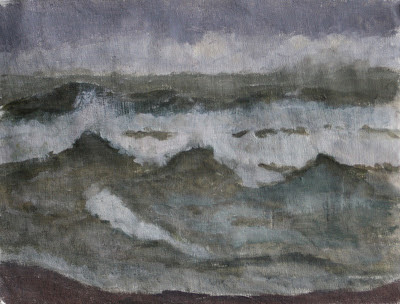 Basically when I get to the spot I want to paint from, I study the ocean and look at what the waves are doing. I find something I personally like and focus on that particular kind of wave or shape. If it isn't raining too hard, I do a sketch, piecing a composition together. I don't always stick to the sketch but for this painting I pretty much did. Once I have watched awhile (amount of time depends on weather conditions) I set up my gear and start to paint. Unfortunately the tide is going out during the morning hours at this time which means my subject is moving away from me. When the tide gets to a certain point those cross-wave no longer happen. I like to build the sky first and then I look for similar waves and action to paint the idea I had. I paint until I can't figure out where to go next and then I study the waves again. Once I get the idea, I paint some more. I usually reach a point where I can't remember any more and the scene has changed so much that I can't watch to refresh my memory. By that time, about 3 hours has passed and I am ready to pack up. Sometime I can get everything I want to in the sketch, sometimes I have to put in a little more time on it in studio. I went out today too but will share that one in a post tomorrow. I must be losing my mind. I read this when you posted and was sure I had commented. I love this painting and I could go on and probably did in my mind the first time, but now, just wishing you a wonderful holiday to you and yours. I know it may be hard having lost someone close recently, but my best wishes go out to both of you (and Twill)for a grand and exciting 2013.